Rob McLean is owner of Wyoming-based "Freestone Flies -- Materials and Guide Service". 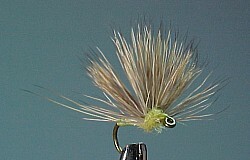 Rob manufactures a wide range of fly-tying products which can be found in his catalog, many of which are used in the two quill-body flies pictured below. These two images above are of the same Slickwater Sulphur Parachute, with different lighting. Note the barring on Rob's turkey flats. The secret to Rob’s quill-body flies is, you guessed it, the quill-body. 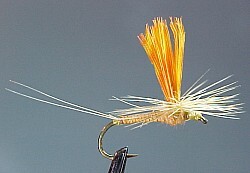 He uses his own McLean’s Quill Body material, which is described in an excellent article by Stephen Hays called "Slickwater Quill-Body Flies" in the March, 2000 issue of Fly Fisherman magazine. And, of course, feel free to contact Rob at the e-mail address above. 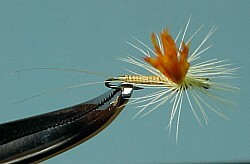 Bob uses porcupine guard hairs for the quills that were used in the two quill-body flies shown above. Don’t confuse porcupine guard hairs with porcupine quills, however. Rob points out that the guard hairs are somewhat hollow, as evidenced by the fact that they can be flattened with a thumbnail. He feels that this results in more buoyancy than other quill types. As you can see in the beautiful samples above, the material shines and shows segmentation, very much like a real insect body. Dyeing is not easy, but Rob has developed a system that gets the job done without making the quills brittle. 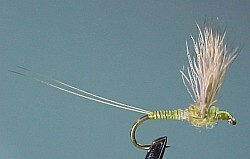 Rob says the guard hairs rarely break while wrapping, but they do suffer from cuts and bruises from trout teeth and forceps. He suggests applying a drop of head cement at the tie-in and tie-off points. Ribbing with monofilament thread reduces the sheen of the body, writes Hays, but my thought is that it likely reinforces the quill. Hays mentions two other tips suggested by Rob. First, use a few "soft" wraps of thread when tying off the material, with more tension for the final wraps. This will reduce the chance of cutting through the material. The second tip is to taper the body, if desired, with a thread underbody, before wrapping the quill body.